From the 31st to the 2nd of June 2016, the fifth Wastekhoro was convened in Durban to strategise dealing with waste management issues in South Africa. High-ranking officials of the municipality were part of the conference, as was the Minister of the Department of Environmental Affairs. Usually, this is a meeting for government officials and has been convening for the past four years. This was the first time it was open to the public and as a result more than 750 people attended and all nine provinces of South Africa were represented. Provinces presented what progress has been made since the last waste conference. Most of them made it clear that they are struggling in terms of waste management, even the management of dumping sites. There was a strong desire by the group that we have to move to a Zero Waste approach rather than continuing only with disposal. Approval of the new landfill sites has become a mountain to climb for municipalities as a result of them failing to realise that the Waste Act promotes reduction, reuse and recycling of waste rather than disposal. Regionalisation of landfills is also encouraged, making sure not all municipalities have their own little dumpsite. The department is encouraging the conversion of old landfills to buy back centres or materials recovery facilities (MRFs). The waste sector alone is worth more than R25 billion and we have to create jobs and promote recycling in all the cities. The South African government has already agreed with us that the waste management through recycling would not be possible without waste pickers. However, better working conditions should be created for waste pickers, making sure that they do recycling but not at the dumping sites. Minister Molewa explained that “these are the people who have expert knowledge of the recyclables and would add a lot of value if they are to be considered whenever new recycling facilities are being developed”. The meeting agreed that buy back centres and materials recovery facilities have to be built to create conducive conditions for waste diversion from landfills. Waste pickers have to be assisted with protective clothing and with any support that they might require. The Department of Trade and Industry was also part of the conference and they wanted to consider applications from waste picker cooperatives. The main problems with waste pickers’ work is not only the creation of a conducive environment, but also the support and acceptance that they are failing to receive from municipalities. It is good that government recognizes that waste pickers are also vulnerable workers who have undertaken an often thankless task under very harsh conditions to provide food for their families. The department is working at bringing the country’s more than 62,000 registered waste pickers into the formal waste economy in consultation with all the stakeholders, including waste pickers themselves. The highly populated and urban provinces have the highest number of waste pickers. In other words, Gauteng, Western Cape and KwaZulu-Natal have the most waste pickers because of their urbanization and population. Having listened carefully to the speech made by the Minister, it is clear that waste pickers are now recognized in South Africa. However, it is not enough because this is pronounced only at a national department level: all the policies, regulations and recommendations have to be filtered down to local municipalities. The Minister’s speech poses a challenge to the Minister of Local Government and Traditional Affairs, mayors and officials of municipalities to recognise and integrate waste pickers more meaningfully. Since waste pickers have been recognized, the Minister has donated trolleys to the organised waste pickers during this conference. The handover ceremony will take place within the next two months. 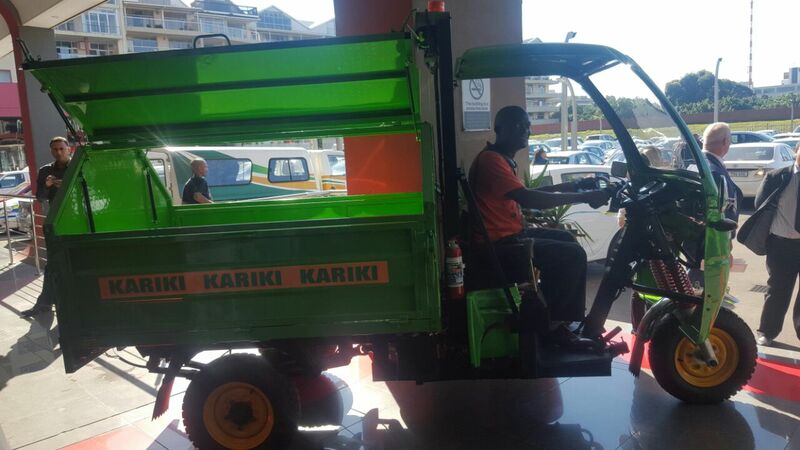 Tools that are expected by waste pickers other than trolleys are tuk tuks, motorized tricycles and manual tricycles. Some of these tools were displayed during the conference. The industry is speaking volumes about how much they recycle. Collect-a-Can recover 70% of the cans.. The industry fails also in asking themselves how much money they filter down to waste pickers. The recycling rates are up due to exploitation suffered by waste pickers. This is like the blood diamonds scenario, where consumers consumers never ask themselves where the diamonds they so love come from and how they are produced. People die for the diamonds that the society enjoys. Similarly, industry needs to understand the lifecycle of their products and make sure that they understand every phase that these materials go through. The focus was not only on general waste but also hazardous waste, especially mercury. Mercury has been a challenging chemical, specifically in Kwazulu-Natal. The notorious mercury storage site in Cato Ridge has not been cleaned up ever since more than forty workers were either affected or killed by mercury poisoning. Thor Chemicals is still storing 2700 tonnes of mercury waste. Civil society has been pushing for the cleanup. Thor Chemicals has been sold to Guernica Chemicals which is almost bankrupt and therefore cannot fund the cleanup of the mercury. Government also has not got funding for the cleanup. Mercury has to be phased out and a roadmap for phase out is being developed by government since the signing of Minimata Convention. The plant at Cato Ridge has contaminated the ground as well as the nearby water bodies. Studies have been done in the past and it was proven that contamination by mercury has really happened in this small town. Due to dangers posed by mercury and work previously done by groundWork on this issue, mercury thermometers have been phased out in most hospitals in the country because once these thermometers break it exposes people to mercury. A brighter future for waste pickers is looming if the national government implements what they plan. Funding opportunities for waste pickers from various departments will improve their working conditions. The Department of Environmental Affairs’ Green Grant, as well as Department of Trade and Industry cooperative incentive schemes and municipal infrastructure grant, have the potential of funding recycling projects. This means that there is enough funding for waste picker cooperative projects. The entrepreneurs were also encouraged to have a look at the opportunities brought by waste. They were also promised funding by government.